Tragic, thought-provoking and mind-numbingly brilliant, the ending of Brave New World is so fitting. A truly fantastic ending. It has been a while since I read Atonement, but I still remember the ending having a profound effect on me. After the entire novel being focussed on Briony's atonement, the ending is so apt. This ending is complete perfection – I adored it! Lily Briscoe's satisfaction with herself makes it a satisfying ending for me too. An enigmatic ending for a simply perplexing novel. I just want to know what happens next! As I wrote in my review, "it's a novel reminiscent of the tinkering bell at a bookshop door: full of hope and promise" – and the ending echoes this more than anything. Heartwarming. The ending of Never Let Me Go is… indescribable, pretty much. The final passage is one of my favourites from literature, regardless of how heartrendingly painful it is to read. And, no matter how impossible you know it is, every time you reread the passage you always hope for the same implausible event to happen. Extremely Loud and Incredibly Close has an ending I simply can't do justice to. The best ending. If anyone has read the book, you'll understand what I mean. The last sentence killed me. I wanted to cry and throw the book at the wall and scream… but oh it was the perfect ending for the perfect dystopian tale. Did you enjoy any of these endings? 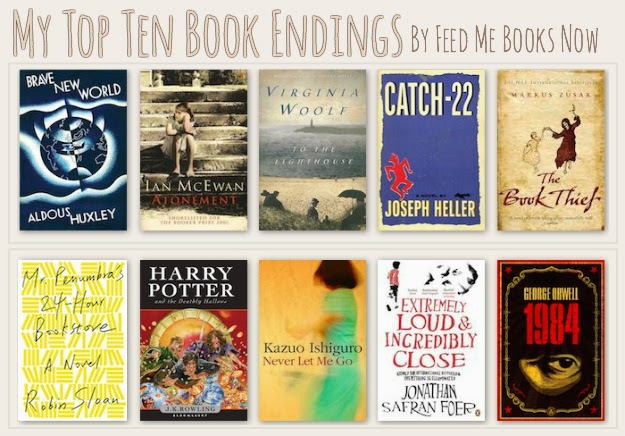 Do you have any favourite endings? The ending of Harry Potter and the Deathly Hallows is just perfect. I know it's not to everyone's taste but "All was well" is a phrase that will always mean a great deal to me. My favourite books are one here. Mr. Penumbra's 24 Hour Bookstore, Harry Potter (well yeah. The ending is explainable enough. I remember finishing the book off with a sigh and then hugging it close to my chest. Who knew these books were going to change my life? ), The Book Theif and Catch-22. Oh God. These books are amazing. Yes – it definitely is! Um, I can't *quite* remember how Extremely Loud and Incredibly Close ended. Obviously it didn't make much of an impact on me!! Aww it made such an impression on me! Remember the last few pages (the flip book thingy???)! Ruby! This is such a sweet post! 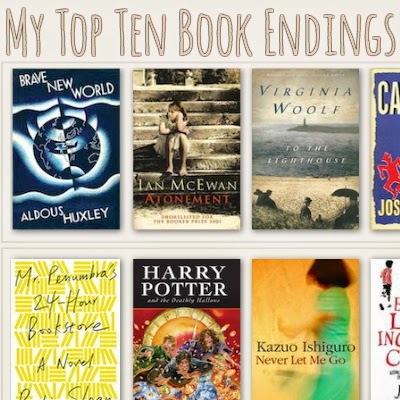 Whilst I've only read two of these books- The Book Thief and Deathly Hallows -your descriptions of every ending makes me want to pick up ALL THE BOOKS! Thanks for writing this, and I LOVE YOUR NEW BLOG DESIGN. It suits your blog SO MUCH! I have to read so many of these VERY. SOON! Actually, other than Deathly Hallows (which I've read) and To The Lighthouse, all of these are either on my TBR or wishlist.